Cecil Rhodes, Prime Minister of the Cape Colony (1890-1896) impacted Southern Africa forever with his ambition and ideology. However, on the day of his death he concluded, “So much to do, so little done.” Although much had been accomplished, he saw it as a fraction of the potential that could be realized in this land. In 2016, my wife Andrea and I moved to Cape Town, having been commended to the grace of God by the assembly at Glencraig Gospel Hall, Scotland. We have two boys, Alexander (7) and Daniel (4). There are around 57 million people in South Africa at the moment. Most of this population is concentrated in the large cities. The population of Cape Town is approximately 4-5 million people. Presently, there are around 80 New Testament assemblies across the country. Some of them are over 100 years old, whereas the majority have been planted in the last 30-60 years. Approximately 40 of these assemblies are in the Western Cape Province, six nearer to Port Elizabeth, with the rest being centered around Gauteng Province, Durban, and the South Coast of KwaZulu Natal. About 20 of these assemblies are located within the city limits of Cape Town. Our work here consists of preaching the gospel and teaching the Scriptures, both in Cape Town and also across the country. We try to help some assemblies on a regular basis, including the assembly at Northpine Gospel Hall (our home assembly here). The assembly is small and faces a number of challenges. We have assisted with the restarting of a weekly Bible Reading which we feel is beneficial. I also have the opportunity to teach the Scriptures at a monthly ministry meeting in which we move systematically through the Scriptures. On a weekly basis, together with Rodney and Joy Brown (N. Ireland), we also help in a children’s meeting at a nearby township. This is a poverty-stricken area, and the children come gladly, learn their memory verses, and sing the choruses loudly. In the better weather (yes, we do have a winter in Cape Town!) Rodney and I carry out house-to-house visitation and preach in the open air. In the poorer areas we always get an audience and seldom any opposition. Our wider movements include visits to KwaZulu Natal, Port Elizabeth, Gauteng Province, as well as visits to many rural assemblies across the Western Cape Province. 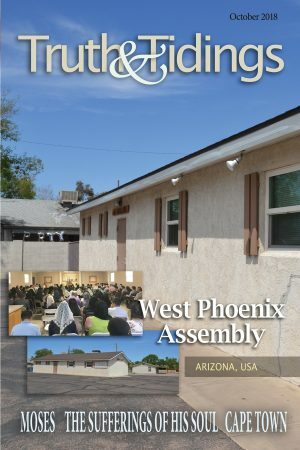 We often try to cover topics that have been somewhat neglected in parts of the country, such as “The Offerings,” “The Feasts of the Lord,” “Egypt to Canaan,” and “New Testament Assembly Principles.” Some assemblies we visit with these topics, particularly in rural areas, tell us that they have never heard these things taught before. Racial tension – Apartheid (state sponsored discrimination from 1948 to 1992) changed this country forever. The wounds are still open for many. The so-called “white” assemblies have now closed or have become mixed over time, with most assemblies in the Eastern and Western Cape being composed of mainly so-called “colored” believers. “Colored” is not generally considered to be an offensive term here but is used to describe people of mixed ethnicity. Racial tensions remain a serious issue in society here. Language – We have 11 official languages, one of which is English. English is a good meeting point and allows you to preach in most assemblies. However, many assemblies in the rural Western Cape function in Afrikaans (though they can usually understand English). Afrikaans is not a “white man’s language,” as some suspect, the majority of speakers being “colored” people rather than white. We have been learning some Afrikaans since our arrival and I can now preach the gospel in Afrikaans with some prior preparation. Doctrinal Pressure – Things “most surely believed among us” are under attack in South Africa and even in some assemblies. Many believers lack a grasp of the uniqueness of a NT assembly and do not have clear convictions about the pattern. Even more alarming, the Charismatic Movement has taken serious hold in South Africa to the extent that the assemblies amongst which I move are some of the very few congregations that are not encouraging “spectacular” spiritual gifts. Many believers have questions about these issues and are being led astray by “Christian” media broadcasts. We often deliver teaching on these issues. Seeing the extremes of the charismatic movement up close, you learn that this issue is not just an interesting debate but a movement that originates in Hell itself. Gospel Work – There is apathy among many believers here when it comes to reaching the lost. This is not true of all but it is a trend that is apparent, despite every opportunity in this land. House-to-house visitation always yields opportunities to explain the gospel. Open-air preaching is an open door in many areas. However, series of gospel meetings are difficult. There is often a lack of desire amongst believers and it is very hard to stir up an interest in the community. Everyone has “their own church” and thinks they are going to Heaven, so unless you have better entertainment than “their church,” there is little prospect of them coming. We have recently obtained a Gospel Tent and hope to begin using it when the warmer weather returns, God willing. Crime – The main hindrance to our activities here is crime. The best gospel opportunities are often found in the most dangerous parts of the city. There are many areas where it is reckless to do house-to-house visitation alone. Human life is very cheap. You can be shot or stabbed for a cell phone. A number of assemblies are also located in areas such as these, so we are regularly in these dangerous areas for one reason or another. The Lord has kept us safe thus far and we look to Him to shield us from danger.